Hi, gang! Do you ever feel like there's just not enough Psycho Motel type action going on in Liverpool? Get bored waiting for the next Kazimier party to roll around? Well, check this out, kids! On Friday 16th March, we invite you to join us at Basement 20 (below 'The Lyrics Lounge' on Hardman St.) for the first of our streamlined spin-off events that shall henceforth be known as... PSYCHO MOTEL MICRO! Garage Surf monsters (and Psy Mo regulars) EL TORO! return for their first gig of 2012, and they've finally got that drummer problem sorted! Enter Gabrielle Dos Santos (Town Bike, Dinnerladies) on the hot seat. This will also be the first chance to hear a bunch of their new tunes before their E.P release this spring!! ...plus - we've somehow managed to pin down punk rock renegade globe trotters THE DEAD CLASS, check out the video below to get some sort of clue about how these rowdy bastards do business!! ...and that's not all... oh no! 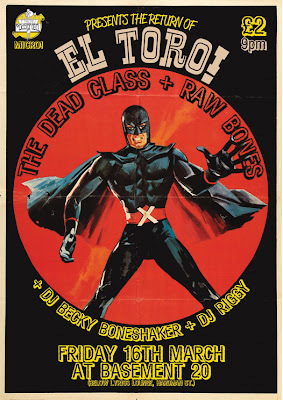 Those demented rockabillys RAW BONES will be opening the festivities with their twisted rock n' roll noize!!! Roll on!!!! 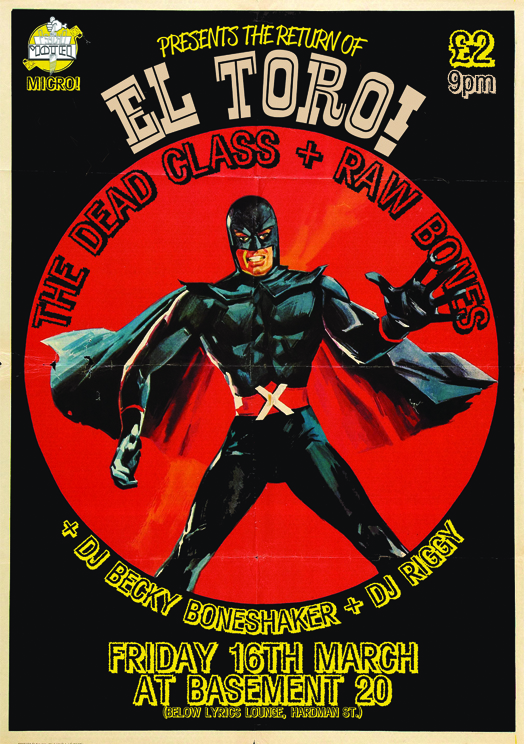 ...an' we got DJs, of course, in the form of Psycho Motel's resident artist BECKY BONESHAKER and our pal RIGGY, a collector of unusual sounds, will be blasting you with all the best in garage, psyche-billy, weirdo and scary 'til the wee hours! All this for just 2 quid!? SEE YA IN THE BASEMENT!!!! Psycho Motel Vol.1 (2010-2011) FREE COMPILATION!